We’d love your help. Let us know what’s wrong with this preview of Better Off Thread by Amanda Lee. To ask other readers questions about Better Off Thread, please sign up. This book was so much fun to read, and despite the fact that I hadn't read any of the other books in the series, I felt totally at home with the characters and with their roles in the story. Marcy is the kind of protagonist I adore -- a caring, capable, courageous woman who goes out of her way to help anyone in need. I'm definitely going to backtrack and read some of the earlier installments in this charming series! A great pre holiday who-dun-it filled with all the feels! Love her dog so much and I am very sure every time I read one of these books that one day I will have a dog just like Angus! Amanda Lee writes a great character and captures the feel of the small town perfectly in Better Off Thread. This is one to add to your pre Christmas to be read pile for sure! I really enjoy this series and this particular book 8s my favorite song far. Marcy is a fun character and her nosiness gets her into some sticky situations. Fans of this series will be delighted to read Better off Thread. This was my least favorite of the series. But I hope there are more!! This is the first of Amanda Lee’s series that I’ve read and I enjoyed it very much. When I think of the term “cozy mystery,” Better Off Thread fits the description perfectly. All the essential elements are present … small-town setting in Oregon, amateur detective who owns an embroidery shop, a strong supporting cast of friends, intuitive investigation, humor, a sweet romance, and the most adorable Irish Wolfhound named Angus! The writing is tight, flowing smoothly throughout. And, to top it all off, this story is completely clean – no graphic scenes or profanity! A story or series is only as strong as its heroine, and Marcy, owner of Seven-Year Stitch, is wonderfully appealing. She’s sensitive, caring, and intelligent – the kind of person you would want for a friend. Marcy even has the hidden talent of stunt driving, revealed in a funny scene. Her romantic interest, Ted, is admirable also and readers will love the surprise ending. This story stands alone, but I’m eager to follow all the characters through the previous books as time allows. The mystery is well plotted and kept me turning the pages. Character depth can make or break a book for me, and that is one of this story’s strengths. I especially enjoyed the scenes of Marcy assisting Santa with the children at the hospital. While Better Off Thread is a perfect read for any time of the year, it is especially enjoyable during the Christmas season. Highly recommended. Within the cozy mystery genre, 5 stars. If you are like me, and like to read Christmas themed books through the month of December, Better off Thread by Amanda Lee is a great one to keep you full of Christmas cheer. Marcy and her dog Angus steal the show in this cozy mystery. I could tell there had been books in this series before this one (quite a few by the look of the inside front cover), but you didn’t feel that you were coming into the party late. You did feel you were coming in during a happy time in Marcy’s life. I don’t know wha If you are like me, and like to read Christmas themed books through the month of December, Better off Thread by Amanda Lee is a great one to keep you full of Christmas cheer. Marcy and her dog Angus steal the show in this cozy mystery. I could tell there had been books in this series before this one (quite a few by the look of the inside front cover), but you didn’t feel that you were coming into the party late. You did feel you were coming in during a happy time in Marcy’s life. I don’t know what Marcy went through in other books, but her personal life was relatively problem free (minus trying to impress the prospective in-laws). I enjoyed this book and thought it was a perfect December read. It even made me want to go find a shop that sells embroidery kits like Marcy has and figure out how the heck she’s been making these adorable sounding Christmas tree ornaments all book long. I thoroughly enjoyed this book. This series is one of my favorites. In Better Off Thread, Marcy finds herself in a holiday whodunnit. Her good friend, Captain Moe, who plays Santa at the local hospital, ends up a suspect in the murder of a hospital administrator. Marcy is determined to find out who is really responsible for the crime. As a result, she ends up in some unsafe situations. In addition to the murder mystery, Marcy is also trying to win over her boyfriend, Ted's, sister Tiffany. She wants to be liked by his family. Marcy is a smart amateur sleuth, tho In Better Off Thread, Marcy finds herself in a holiday whodunnit. Her good friend, Captain Moe, who plays Santa at the local hospital, ends up a suspect in the murder of a hospital administrator. Marcy is determined to find out who is really responsible for the crime. As a result, she ends up in some unsafe situations. In addition to the murder mystery, Marcy is also trying to win over her boyfriend, Ted's, sister Tiffany. She wants to be liked by his family. Marcy is a smart amateur sleuth, though some of her actions are a little questionable. I don't know that I would go to the lengths she does, especially going against the advice of her police officer boyfriend and ending up in danger. The mystery was good and there were a few viable suspects. I liked the book and felt it can be read even without having read other books in the series. Marcy shows up at the hospital ready to play elf for some sick children only to find that Santa, being played by her friend Captain Moe, is suspected of murdering a hospital administrator. Sure that the two detectives in charge of the case aren’t going to worry about finding another suspect since they have Moe, Marcy and friends decide to investigate on their own. I was surprised to find out after I finished this book that it was #10 in the series. On the one hand, I should have guessed because t Marcy shows up at the hospital ready to play elf for some sick children only to find that Santa, being played by her friend Captain Moe, is suspected of murdering a hospital administrator. Sure that the two detectives in charge of the case aren’t going to worry about finding another suspect since they have Moe, Marcy and friends decide to investigate on their own. This review has been hidden because it contains spoilers. To view it, click here. This book follows Marcy whose working in her shop after Thanksgiving and helping customers make ornaments at her shop. When Captain Moe asks Marcy to step in as an elf to help out at a local hospital. What Marcy didn't count on was a murder taking place at a hospital! Who killed Sandra Vincent the hospital administrator? And why is it being pinned on Captain Moe? Will Marcy uncover the murderer on time or will she not make it to Christmas? I really enjoyed this book with the themes of Christmas a This book follows Marcy whose working in her shop after Thanksgiving and helping customers make ornaments at her shop. When Captain Moe asks Marcy to step in as an elf to help out at a local hospital. What Marcy didn't count on was a murder taking place at a hospital! Who killed Sandra Vincent the hospital administrator? And why is it being pinned on Captain Moe? Will Marcy uncover the murderer on time or will she not make it to Christmas? This is the final [as of the time of this review] installment of this series, and it finished strong - not even referring to the twist at the end, which wasn't really a twist. In this, the director of the local hospital is found stabbed to death, and Captain Moe is now a suspect. He is found on the scene of the crime wearing a Santa suit, and the juxtaposition is comically macabre. As the story unfolds, the reader learns that Captain Moe had been secretly dating the administrator, even though th This is the final [as of the time of this review] installment of this series, and it finished strong - not even referring to the twist at the end, which wasn't really a twist. In this, the director of the local hospital is found stabbed to death, and Captain Moe is now a suspect. He is found on the scene of the crime wearing a Santa suit, and the juxtaposition is comically macabre. As the story unfolds, the reader learns that Captain Moe had been secretly dating the administrator, even though they didn't seem quite compatible. As everyone knows, love is quite often a motive for murder. Marcy continues sleuthing in her own way - which is to say completely invasive - to exonerate Captain Moe, and she uncovers several town and family secrets while donning a rented elf suit. Of course, only Marcy would find trouble while reading to terminally ill children in the hospital. And the humor is spot on in this book! More so than in the previous books. In addition, we see developments in the Marcy-Ted relationship, and Veronica, Ted's mom, plays a larger role in this book than in the others. Of course, Angus bounds on nearly every page, and he even gets to play with his bunny friend, Clover. How can Marcy end up in danger while playing a goofy, lovable Christmas elf at the local hospital? Have you met Marcy, the "inch-high private eye?" She is loyal and warm hearted and often a bit too nosy for her own good. She thought the most difficult part of this holiday would be getting her boyfriend's sister to accept her. Or walking Angus on slippery streets. I love all the best friend type characters in this series. How supportive they are and how willing to go above and beyond to help each o How can Marcy end up in danger while playing a goofy, lovable Christmas elf at the local hospital? I love all the best friend type characters in this series. How supportive they are and how willing to go above and beyond to help each other and to find truth. And when reading an embroidery series mystery I am always encouraged to get my stitching out and work on it! That tells you how powerful this author can be. If only I had a sit and stitch square to enjoy. A true cozy lover's cozy that might just surprise you at the end. I accepted a copy of this book in exchange for an honest review. Around the Year in 52 Books 2017 Reading Challenge. A book with an animal on the cover. Captain Moe is playing Santa for the children at the hospital and Marcy is his elf assistant. When they show up on Sunday, Moe discovers the hospital administrator with a kitchen knife in her chest. Since they were heard to argue the day before he is arrested for her murder. When Ted, Marcy, Vera, and Veronica investigate they learn a great deal about the hospital and at least two men with violent, abusive tem Around the Year in 52 Books 2017 Reading Challenge. A book with an animal on the cover. Another fun read. I love how her "brothers" rush to protect her. one thing that has always drawn me into her books is the relationships between people. Not only that of a smaller town where people tend to look out for each other, but of family too. I love seeing Marcy worried about her relationship with Ted's sister. And that Ted's sister wants to protect him. As usual Amanda Lee does i nice job of not making the killer obvious. really enjoyed this book. have read others in the series which have also been good. really liked the characters well rounded and make you feel like you are there. enjoy the small town location. also this book kept me guessing on "who did it" almost three quarters of the way into the book. even having read her other books. can not wait for the next one. A very enjoyable series -- except for Marcy's boyfriend Ted, who has become more annoying with each book. Each time he calls Marcy "Inch High"; each time she sits on his lap like a child ... it makes me cringe. So I've taken away 2 stars in my rating primarily because of Ted, and the end of this latest book. Thank goodness for Angus -- a nonjudgmental male in the series! What can I say about this series that I haven't said already? This far into the series and I still love it. The characters and writing style still good? Check. The mystery and pacing still good? Check. Also what's with cozies and their adorable endings that make you want the next book already? I would love to read more from this series. i ready like this book a lot.Amanda Lee is a excellent author. in this book captain Moe is charge with the murder of the hospital. Marcie and her friends and her police officer boyfriend has to help captain Moe niece (Riley the Lawyer)prove that he didn't do it. i can't wait to see if a new book comes out from this series. The overall series was fine. Not something I would totally recommend to someone. My biggest issue was that each book could be a stand alone, there wasn’t a lot of character development between each book and like 1/4 of each book repeated from the other books. Love, love, love this series! Marcy is such a good friend and I always look forward to the seeing what Marcy will get involved in next. I also enjoy the interactions between Marcy & Jill, Marcy & Ted & Angus, and the usual cast of characters. This is the end of the series and wrapped up many things. As always not everything has an ending. Make up your own. Was an easy reading and enjoyable series. Good mystery to end a series (is it really finished?). Muriel makes an appearance. That hard of hearing little old lady puts a smile on my face. An entertaining read by Ms. Lee. Light-hearted mystery with a touch of humor and romance. The characters are all great. And Angus is the best! Please keep writing! Possibly my favourite one. Just wis there had been a bit more at the end to wrap up the series. one of my favorite titles from this series! great read! Amanda Lee is a pseudonym of Gayle Trent. "Thank you so much for stopping by my site! I live in Southwest Virginia with my husband and two beautiful children, a boy and a girl. I’m a full-time writer/editor/mom/wife and chief cook and bottle washer, and I lov Librarian Note: There is more than one author in the GoodReads database with this name. I live in Southwest Virginia with my husband and two beautiful children, a boy and a girl. I’m a full-time writer/editor/mom/wife and chief cook and bottle washer, and I love every minute of it. Okay, not the bottle washing so much, but the rest of it is great. I’m happy to introduce you to my latest characters, cake decorator Daphne Martin and embroidery shop owner Marcy Singer. Read more about Daphne and Marcy at my blog. 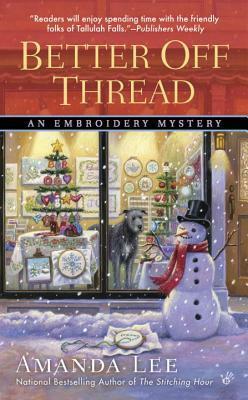 Amanda Lee is a pseudonym Gayle is using for the new cozy mystery series featuring a heroine who owns an embroidery shop. The series is set on the Oregon Coast and features Marcy Singer, a spunky, thirty-something, entrepreneur who is handy with a needle.